Faster, safer, and for more. More Service - More Net Profit. Our listings come with an array of complimentary services from professional home staging to home inspections. Our focus is to sell your home not just list your home. We will do everything we know is best to sell your home faster and for more than any other broker. A higher sold price and little to no seller spending means a higher profit. Much higher. Trained Experts - Managing Experts. Although our agents are knowledgeable and even certified experts in specialties such as staging and home renovations, we understand the importance of focusing our attention on the management of these specialists. This allows the best work to be completed and every detail to be perfected; This allows us to focus on the overall preparation, presentation, sale, and transaction. More Experience - More Hustle. We understand the differences and requirements in selling each type of home. We have experience, expert knowledge, and resources in selling luxury homes, multi-residential investment homes, co-ops, condos, new construction, and land. Our experience is second only to our strive to be the best at serving you. "He walked me through all the steps, gave me a clear sense of timing, provided great tips and recommendations, and made the work as simple as possible for me all while having a great, positive attitude. My unit went well over listing price and I'm confident that Brian had much to do with it. I plan to use Brian for the purchase of my new place." Keep buyers looking at your listing longer to have them remember your home easier. 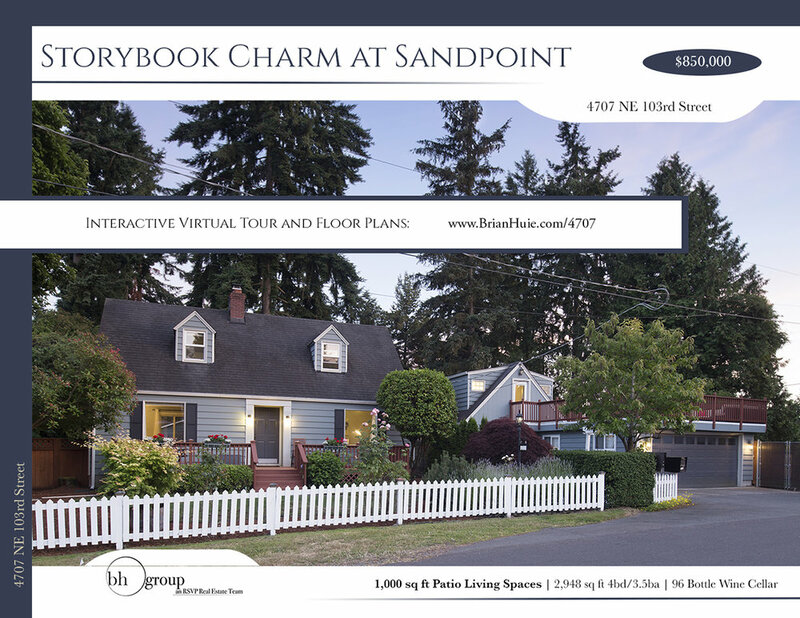 Stand out amongst thousands of listing photos with a personalized webpage for your home with a full suite of visuals such as dollhouse view, floor plans with measurements, and 3D interactive tour with VR and 4k capabilities. Click the image below for a sample interactive tour! All imaging is completed only by professionals - Experts hired and overseen by your listing agent. True professional photography is about lighting, not HDR filters; composition not editing; timing and not brightening. BH Group listings routinely receive compliments on the photographers we use as we only contract ones who use traditional techniques and not quick photo fixes. Pictures pop, features are shown off, and scenes become memories. All imaging is done by professionals hired and overseen by your listing agent. Home staging is the art and science of putting life into a space and to highlight features and finishes of that space. Not only does expert staging make a room seem larger and brighter, but it also helps people visualize their furnishings and life in the room. Staging is proven to increase sales prices while decreasing time on the market. Although our brokers are trained in staging, we hire only professional high-end and luxury stagers - We will work with the stagers but as your listing agent, we will focus on managing the entire project and let the specialists do their specialty. Offering a free 1-Year Home Warranty to a prospective Buyer may help put their minds at ease when comparing your home with a new construction. Electric, plumbing, and appliances are all covered not only for 1-year after the sale, but also during the listing of the home to minimize strain on the seller if anything should need repairs. A fully licensed and bonded home inspector will inspect your entire home. Depending on the strategy that we prescribe for your listing, we may recommend that the inspection only be seen by prospective buyers or by both the seller and buyers. An alternative is that the seller can make some repairs and provide an annotated report with indicated repairs. It's simple - The more availability for buyers to see the home, the more potential offers; The more offers, the more escalations; The more escalations, the higher net profit! Flyers, postcards, and information sheets are a direct representation of your home. Experts designed and built your home; Experts should design your home's representation. Our print materials are designed by professional designers, to be printed on only high-end finishes, and distributed by marketing experts. Your home will appear on 1000's of websites through a professional marketing syndication and the NWMLS Matrix IDX. This combined with social media presence and paid advertising creates a global presence of your home. Attractive, attention commanding, and to the point. All of our signage mounts on posts and frames which hold other detailed information such as flyers, direction signs, balloons, and weatherproof specification sheets. A pillar of our business model is relations; Communication is the key to relationship. We believe in outstanding communication with not only you, but also prospective buyers, buyer's agent, buyer's lender, other competing listing agents, and neighbors. BH Group listings are cleaned before staging - We want the absolute best impression for prospective buyers. We keep green cleaning solutions, a compact leaf blower, and a compact vacuum to tidy up before and after each open house and in between days. Near the closing of the transaction, we have your home cleaned once more as the newest version of our NWMLS contracts have an election that the 'seller shall have the home cleaned prior to closing' that is often times selected. This is an often times overlooked service despite it being on our contracts. Plus it's just nice for the buyer to move into a clean home! You have enough on your plate - let us make sure the home is cleaned and your transaction moving smoothly! Your home, sold. Faster, safer, and for more. First step is to request our free, no-obligation comparable market analysis report of your home.